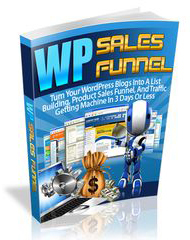 Before You Gain Access To WP Sales Funnel..
Are You Planning To RE-SELL 'WP Sales Funnel' as your own product? If you pick up this offer, you'll get the exact sales funnel which includes the squeeze page, the thank you page, the giveaway videos, the special report, the email follow up series, and this one-time offer page so you can build your list and make even more money from this package. You'll be able to give away Personal Use copies of the Sales Funnel videos and then immediately sell PLR rights to the complete package over and over again at WHATEVER PRICE YOU WANT and get paid instantly! Make your move today and upgrade to the WP Sales Funnel List Building Kit for only $5.00! ...you won't regret it. P.S. I've done everything in my power to make this easy for you. Once you setup your own sales funnel for WP Sales Funnel, all you have to do is give away the videos to build your list (or sell it!) and keep all the profits!